I’ve been working on replacing the image info sidepane in EOG with an image properties dialog. IMHO, this is a less invasive and more consistent aproach. The sidepane takes too much space of the image view mostly when you want to visualize the image EXIF data. Also, just dumping all EXIF data is not very user-friendly. Therefore, another goal here is to make it more user-friendly. So, in eog-ng there’s an EXIF tab in image properties dialog which at first sight only shows a summary of the most common things you want to see in EXIF (aperture, shutter speed, flash, ISO, date, etc). But I still want to give the possibility to view the whole EXIF data for advanced users. So, just click on the “Details” expander and you can view all EXIF tags. 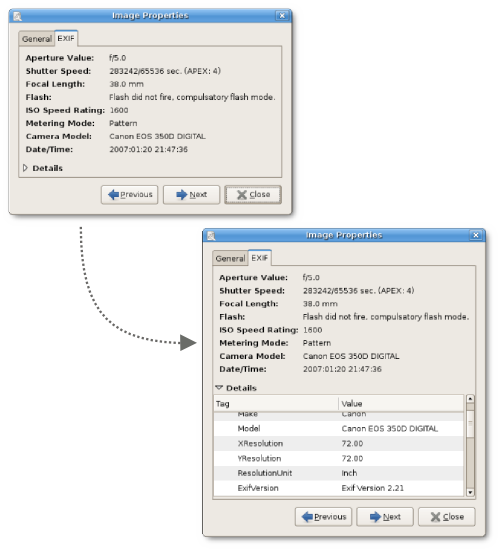 With the navigation buttons in the dialog, you can easily check EXIF data from each image. I still want some feedback about it and some help on which EXIF should appear in the summary and in what order. Discussion about image properties should take place in bug #313676.